Floyd “Money” Mayweather Jr put to rest any belief in Oscar De la Hoya’s so called blueprint designed to beat him. The 36 year old Mayweather appears to be like a fine wine, getting better with age as he dominated Saul “Canelo” Alvarez on Saturday night. In typical fashion, Floyd appeared to take his time in the early rounds to gauge his opponent’s game plan. 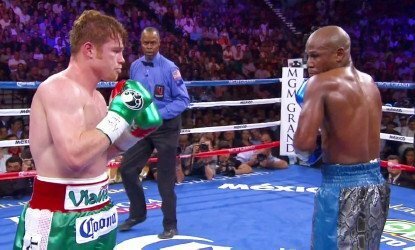 From then on, the fight was a technical mismatch as the teacher (Mayweather) took the pupil (Alvarez) to school round after round. In the end, Mayweather was awarded a majority decision. Scores were 117-111 (Craig Metcalfe), 116-112 (Dave Moretti), and the atrocious 114-114 card turned in by the infamous C.J. Ross (seen here boxrec.com/media/index.php/C.J._Ross). I had the fight scored 118-110. One has to wonder who, outside of Father Time, will be able to beat Mayweather at this point. I don’t think the answer is Danny Garcia, Devon Alexander, or Amir Khan. The person that may be able to pull it off is probably in the 5th grade right now, and doesn’t even know he’s going to be a boxer. Most people would like to see a move up to fight Sergio Martinez. Martinez is an HBO fighter and some strings would have to be pulled for that one. These final fights could simply be a victory lap for Floyd unless the reflexes start to slip. Even then, it’s going to take a hell of a man to dethrone him. While some (myself included) saw some slippage in the Mosley, Ortiz, and Cotto fights- it’s apparent that Floyd may have over-trained in those bouts. If such is the case, then I think more credit should go to his father, Floyd Mayweather Sr. Floyd Jr seems to have his legs back at full strength and if he does, we could be looking at him run the tables to 49-0. Most writers have given him the credit he deserves. If they didn’t before the fight with Alvarez, they do now. However, there are some that still have trouble calling him a great fighter. Arguably great? No. Great? Yes! All-time great? Yes! The guy is a nine-time champion in five weight divisions. What more does he have to prove? There is no argument. I’m not sure what’s next. I’d like to see him do one more and ride off into the sunset. However, he says he’s going to fight in May and then September. Boxers have the tendency to stick around too long and if he honors his Showtime contract, he will be pushing 39 years of age. Who wants to see Mayweather vs. Devon Alexander? I don’t. Anything less than the Amir Khan that showed up against Judah is unacceptable. Amir has to beat Alexander in December for this bout to happen. As great as Danny Garcia was on Saturday, he’s still a junior welterweight who hasn’t tasted the 147 pound weight class. Maybe if Manny Pacquiao beats Rios and then wins again… Uhh, never mind. You are here: Home / Boxing News / The Pound for Pound Picasso Exposes Oscar’s Blueprint… Again!